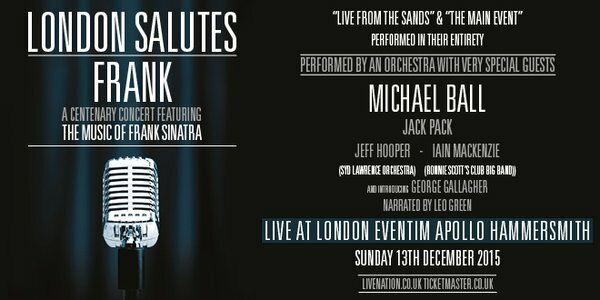 London Salutes Frank Centenary Concert to celebrate 100 years of Frank Sinatra is being performed at London Eventim Hammersmith Apollo on Sunday 13th December at 7:00 pm. 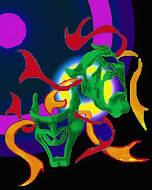 It features ‘Live From The Sands’ and ‘The Main Event’ performed in their entirety by a full orchestra and singers. The line-up will include special guest singers including Michael Ball with more names to be announced soon . 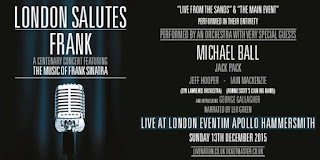 Recreating the same Musical Arrangements used on these two albums, The Peter Long Orchestra & Singers Iain Mackenzie (from The Ronnie Scott’s Orchestra) & Jeff Hooper (Ex Sid Laurence) will perform two of Frank Sinatra’s greatest live albums of all-time as Leo Green tells us the stories behind the songs and Mr Sinatra.